Ganesha Chaturthi ended with a curious police officer photographing the elaborate silver carriage that had carried a Ganesh statue through a grand procession. Ganesha was returned to his place in the temple. The crowd of people who had accompanied the carriage went into a large hall inside and ate free lunches that temple staff were handing out. 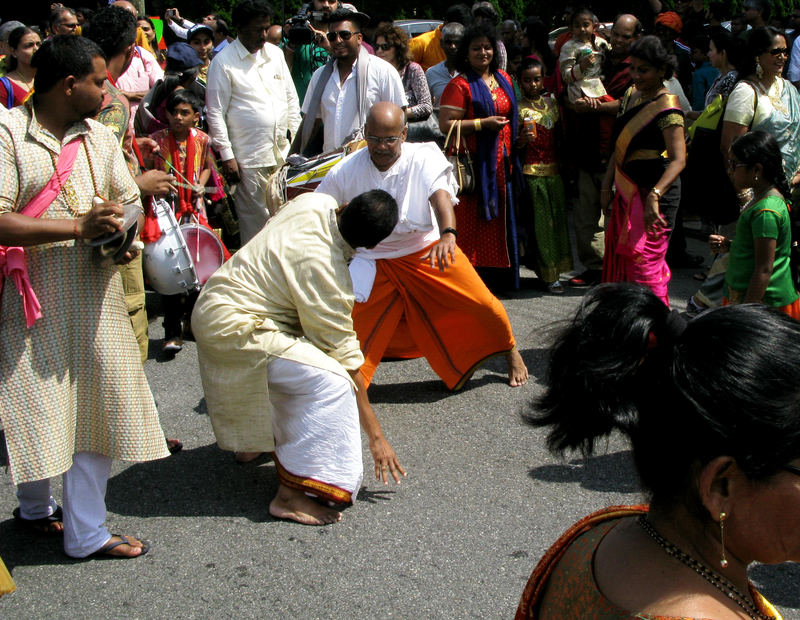 The Ratha Yatra had begun a few hours earlier. 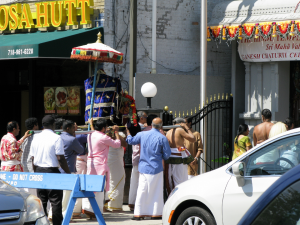 Hundreds of people gathered in the street outside the temple and watched as a truck pulled the carriage away from the temple, two musicians sitting in the truck bed and playing ceremonial music, and two priests standing on the carriage continually making offerings of food to Ganesha. 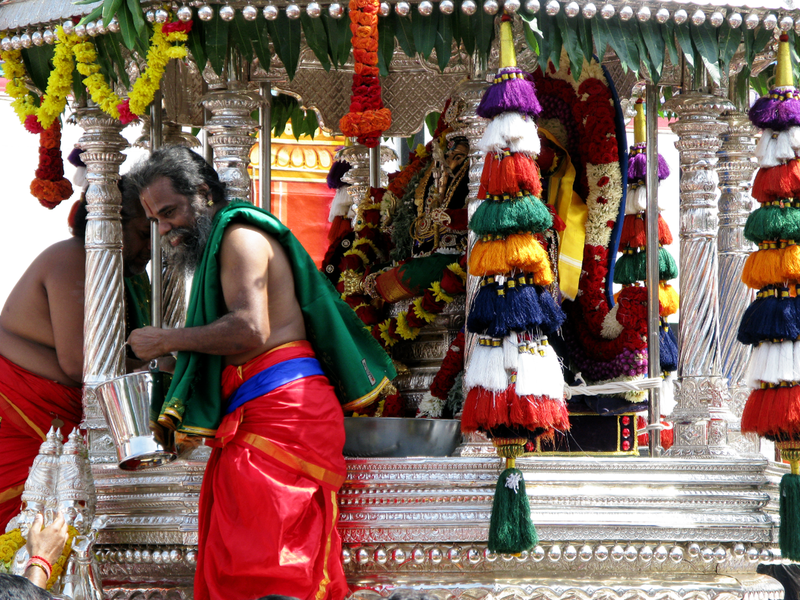 I do not know what happened to these offerings, but celebrants brought food to the people following the carriage throughout the Ratha Yatra. They ran out from shops and vans and handed us samosas and sweets. 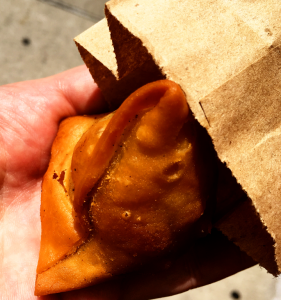 One of the samosas I had was especially good—the crust was crisp, light, and oily, and the potato filling had a robust, warmly spicy flavor. The sweets were light and quite tasty. I had been told by a Nepali friend that “Indians are really crazy” for this holiday, and it was indeed remarkable how joyful the crowd was. A drummer marched thirty or forty feet ahead of the carriage, and there were usually several people dancing around him—the men moving at each other with sudden changes of direction, almost mimicking confrontation, and the women throwing their hands in the air and twirling. It was a very long and winding procession, approaching the heart of Flushing’s Chinatown at one point, and drawing the mostly East Asian shop owners out to watch. The samosas were not adequate to fend off hunger, and when we returned to the temple, I lost no time in claiming a free lunch. 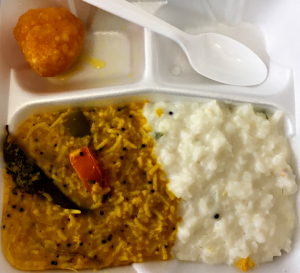 Lunch consisted of rice with dal and yogurt rice. The dal was hot and had a certain severity—there was no hint of sweetness to it. But it was excellent. The yogurt rice was a nice cleanser after this. The best part was the laddu for dessert. This was a ball of dough, probably gram dough, sweetened with sugar. Simple but delicious. See Part I for information on The Canteen, open for breakfast, lunch, and dinner every day. 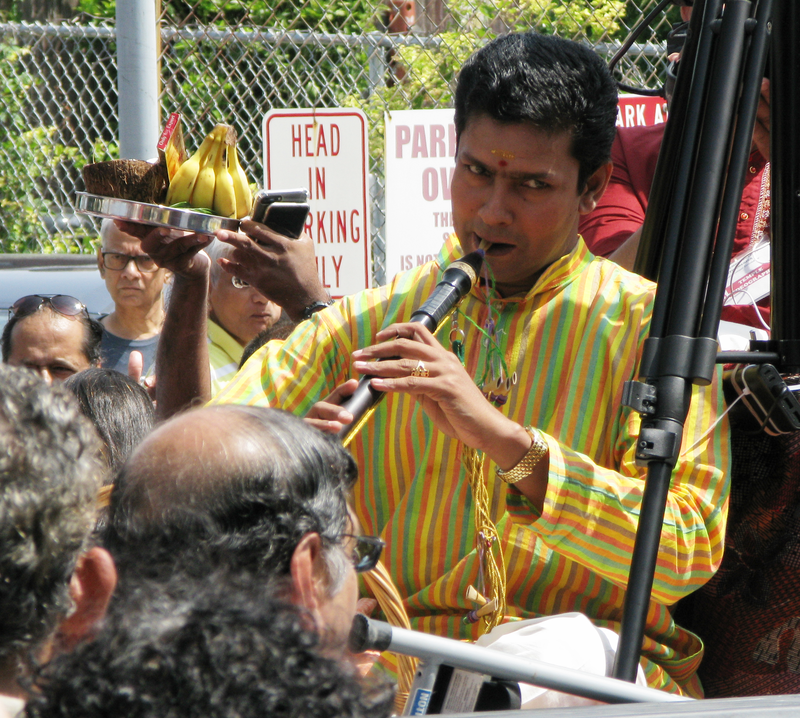 Starting Thursday, many Hindus in Queens began observances of Ganesha Chaturthi, a ten-day festival dedicated to Ganesha—remover of obstacles and overseer of beginnings. Perhaps this explains why the Hindu bartender who gives me tips on Nepali language and culture most Thursday nights was absent this week. In any case, Ganesh Chaturthi is a popular holiday, as Ganesha is important to Hindus of all castes, from Nepal to Southern India. 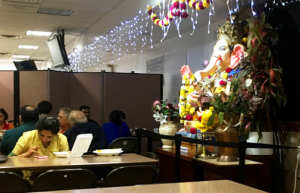 The holiday took me to Ganesh Temple of Flushing, for pujas and also, of course, for food. I sat at the back of a crowd gathered around the tarp covered in fruits. 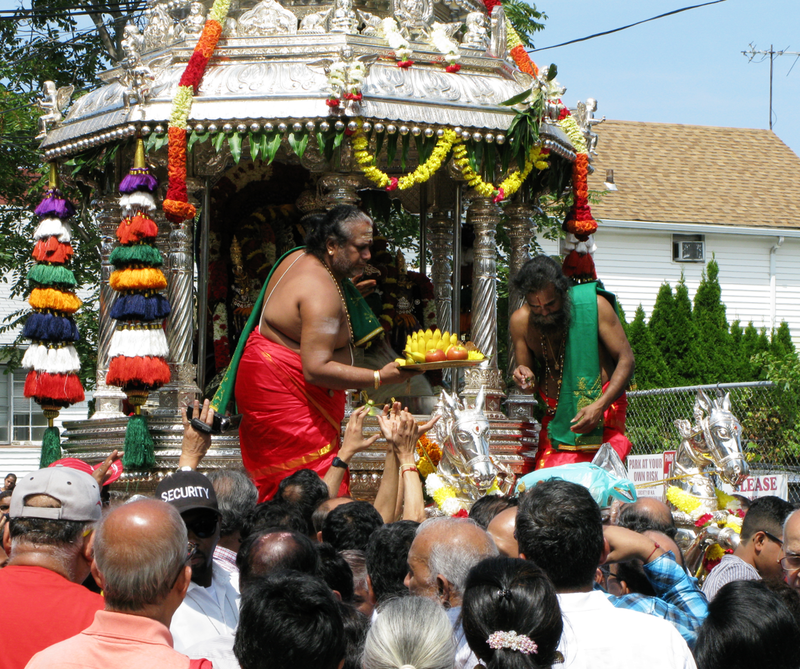 The two men in front of the statue performed the most important functions of the puja. They rapidly recited Sanskrit scriptures while making symbolic gestures with their hands, and tossed foodstuffs on a tray of offerings. 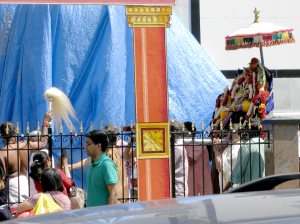 Eventually, they began piling garlands of flowers and fabrics on the statue. Each time, they would hold the item up before the crowd, and everyone in the crowd would lift their hands in front of their faces in response. The musicians frequently contributed—the drummer giving the ceremony compelling urgency and the man with the woodwind giving it an otherworldly feeling. In moments when their playing dominated the room, I began to feel as though I must have entered a nonmaterial world. 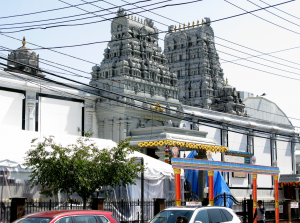 At the end of the puja, a collections plate was passed around, and I followed a group of people past a rather intimidating statue of Sri Shiva, housed in a large columnar case with an open door at the front, and out into a courtyard, where preparations were under way for another puja. I went to the shoe-check with my ticket to retrieve my shoes. Several people sat in folding chairs in the hallway leading here eating boxed lunches that were apparently being given away for free. But I wanted to try the Temple Canteen. The Temple Canteen lies in the basement of the Temple on the other side of the block. It is a cheerless space: the ceiling has cheap foam paneling with fluorescent lights and the floors are covered in linoleum. But a large, colorful Ganesha brightens the room from the back, and when I visited, the women taking orders at the counter were cheerful and warm. A “Ganesh Chaturthi Menu” was taped over the regular menu. I think it was just shorter—they must have been running on a skeleton crew. I ordered masala dosa, yogurt rice, and masala tea and took my number. In spite of the fact that the party ahead of me had ordered enough food to feed a small army, my order was ready in moments. 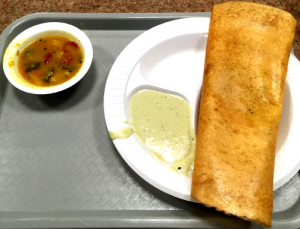 The dosa was freshly made—soft, with the slightly pungent flavor of gram. Turmeric and other seasonings gave the potato filling a nice aroma and taste. The bowl of sambar was excellent: rich, savory dal with onions, curry, and blackened mustard seeds. The bowl of chutney on the side was what captivated me though. Combining cucumbers and chilies, along with creamy elements—including, perhaps, coconut milk—the chutney was hot and cold at the same time, a delightful clash. The masala tea was also wonderful: unsweetened, it combined the flavor of black tea with savory spices like cloves. *Photography is strictly forbidden inside the temple, so you will have to rely on my description for this. Someone has created a shining silhouette of a tree with nails on a wall painted black. The room is dark, with a black ceiling and a blood red wall behind the bar. It feels a little like a club for moody teenagers. The room is filled with the high, nasal sounds of Thai conversation. A waitress seats me next to a slender woman dressed for a night out (or possibly, a night working in another restaurant) who has three large plates of food in front of her. One of the dishes I think I recognize from a Yelp review: weaver ant larva salad. This is, I believe, a dish peculiar to northern Thailand, where in summers farmers dig up weaver ant colonies and harvest the larvae. I order raw shrimp in fish sauce and a plate of silkworms. 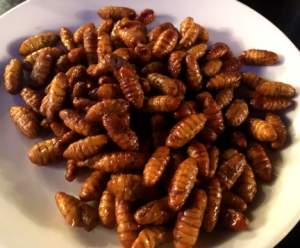 I confirm with the waitress that the servings of silkworms are not very large, because frankly I’m a little nervous about this dish. The waitress is concerned about my tolerance for spicy food, but strangely not about my tolerance for pupae. The shrimp come first. They are beautiful—shelled, whitish, and glassy. They rest in a circle on a bed of sliced cabbage, with thin slices of garlic cloves nested in their tails. They are marinated; the first bite yields complex flavors that take a moment to decipher. There is the aggressive sting of chili peppers; but there is also a cool, refreshing flavor that I think comes partly from galangal. The flavor of the shrimp comes through, of course, though it is more subdued perhaps than the flavor of cooked shrimp. I cannot detect any fermented fish flavor in the shrimp, which is what I expected the fish sauce to contribute, but this comes later, in the aftertaste. The silkworms, when they come, are much more abundant than I had expected. And they are, well, not beautiful. They are fairly large, about the size of bees. They have a golden color, and they are ribbed, or segmented. They burst in your mouth, and release a flavor that is reminiscent of sesame. Mine are unevenly prepared—some of them are quite salty, almost like a soft version of roasted peanuts, and others have more of the natural flavor of the insect. I ask for a box to take most of them home. To finish my meal, I have steamed bread with custard. Quite good. 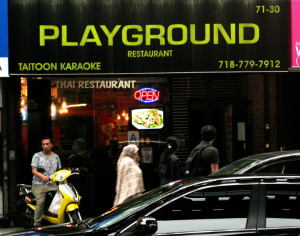 Note the hours below, and the “Karaoke” in the name. Come after dinner hours, and you will find a different scene from what I’ve described above. 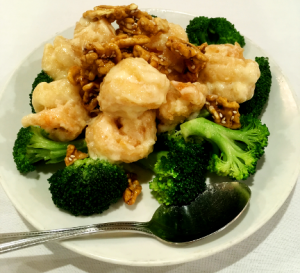 Cantonese cooking seems to have spread across America before any other Chinese cuisine1. 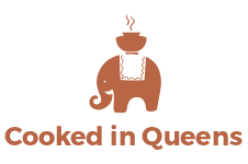 It dominated America’s instruction in Chinese food so completely that we use the Cantonese word wok for the frying pan rather than the Mandarin word, guo. Probably the primary reason for this dominance lies in immigration patterns—a large number of people immigrated to California and other parts of the U.S. from Taishan in Southern China in the 19th century, followed by immigrants from Hong Kong and Taiwan. In any case, China could probably not have chosen a better ambassador. The ingredients often favored in Cantonese cooking may seem strange to outsiders: Yan-Kit So describes several Cantonese dishes made from snakes, and how rice worms, parasitic insects that damage rice plants, are harvested and eaten; and Thomas Hollmann mentions dog, cat, and rat as especially favored by Cantonese cooks. But Cantonese cooking is widely held in high esteem. That said, the Chinese food widely served in the U.S. is not generally held in as high esteem as authentic Cantonese food. 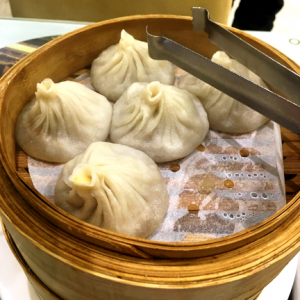 It has its merits, but if you want to appreciate authentic Cantonese food, you have to look further. 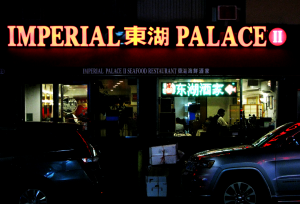 So I went to Imperial Palace in Flushing, which is widely reputed to have excellent Cantonese food. It lies just off Main Street on a quiet stretch of 37th Avenue. The décor here is generally uninspired: the walls have oak paneling and mirrors, and a gilt dragon curls around the back wall. The tables are all covered in plain linen table cloths. There are, however, some intriguing exhibits on one wall—small models of ceremonial vessels framed with text that I cannot read. There are some relatively pricey dishes on the menu featuring prized ingredients like bird’s nest (edible nests made by swiftlets), but I am on a budget, and I know of a few dishes that are supposed to be excellent at good prices. I ordered walnut-mayonnaise shrimp. This consisted of jumbo shrimp resting on a bed of broccoli (steamed and crisp), smothered in slightly sweet mayonnaise and walnuts. 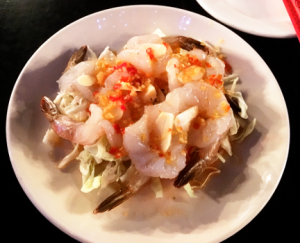 The shrimp was tender, and magically infused with the flavor of walnut. It was slightly sweet, like the mayonnaise. Perhaps honey or some other sweetener was added. The walnuts were candied. The dish was heavenly. 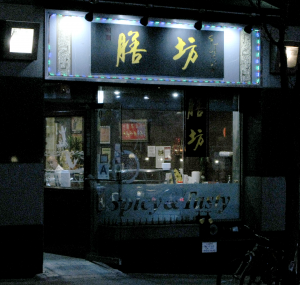 1Other Chinese cuisines were introduced to America on a smaller scale. American diplomats sent Chinese duck eggs back to the States so their countrymen could try Peking duck. See Yan-Kit So. 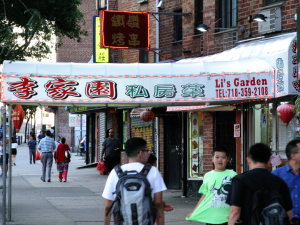 It is hard to detect any regional or cultural enclaves within Flushing’s Chinatown: there are no obvious Sichuan or Hunan blocks. But among the restaurants densely packed in multistory complexes and in food courts, all the regional cuisines are represented. 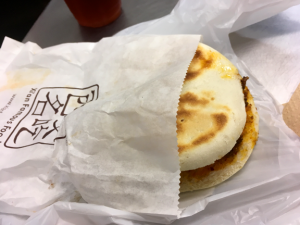 Last time I wrote about Shandong cuisine. 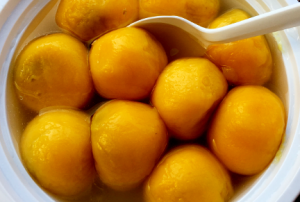 This is not such a popular cuisine outside Shandong, and relatively few restaurants serve it. 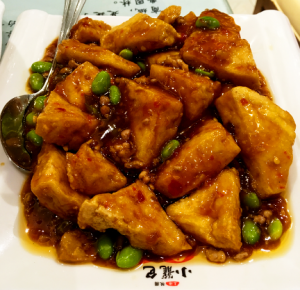 But a more northerly cuisine that has borrowed from Shandong is quite popular: Dongbei, or Manchurian food. 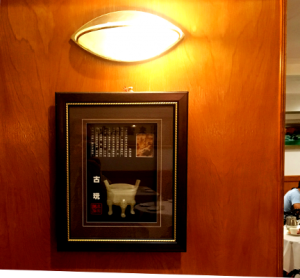 I visited two restaurants serving Dongbei food this week: Xiao Dongbei Private Kitchen and Fu Run. 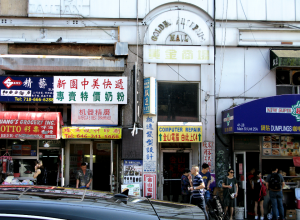 Xiao Dongbei lies north of Roosevelt Avenue on Main Street, where the crush of people shopping and strolling begins to dissipate. Wait staff in sharp black and white uniforms greet you and lead you into a curious dining area. The walls are padded with white cushions with embedded mirrors, and the tables—in a perfectly regular row—have white plastic tops (equipped with an electric burner for hot pot, an important part of Dongbei cuisine). Perhaps it is evocative of Manchuria for people with the right background; for me, it evoked a Stanley Kubrick movie. I ordered shredded pork with fermented soybean paste. This was a heap of cooked shreds of pork, smothered in sauce, with squares of thinly sliced dried tofu. You wrap the pork in tofu and eat it like a roll. The sauce was delicious. It was milder and thicker than soy sauce, and it had a hint of fresh vegetable flavor, almost like a sweet herb. I don’t know much about this sauce, but it likely has ancient roots: fermented soy pastes have been an important part of Chinese cooking since at least the sixth century, when cookbooks documented how to cultivate mold on boiled soybeans and then make a tasty paste out of the blackened beans under the mold. The tofu is an incongruous note in this dish: papery and nearly flavorless. 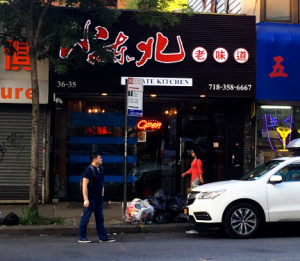 Fu Run is a few blocks away, on a quiet street surrounded by busier streets (Roosevelt Avenue on one side, 40th Road on the other, and Main Street on the other side of the block). The ambience at Fu Run is very different from that at Xiao Dongbei. Red paper lamps and colorful paper animals hang from the ceiling, and large sheets of calligraphy hang framed from the wall. The long row of windows on one side face a leafy walkway leading to an apartment complex, lending the spot a peaceful atmosphere. I ordered home style noodles and pig intestines with green peppers. 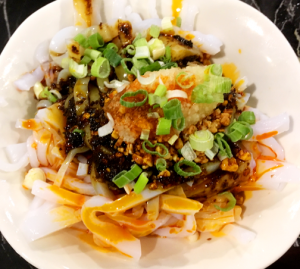 Fu Run is famous for its Muslim Lamb Chops, but they are a little pricey, and nearly everyone who visits here writes about them on Yelp, so I decided to pick from Fu Run’s numerous other offerings. 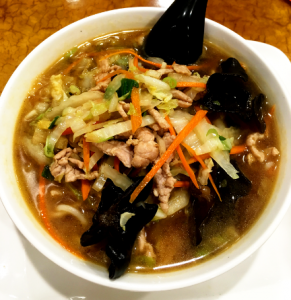 The home style noodles have a wonderfully nourishing taste, reminiscent of chicken noodle soup. Most of its flavor comes I think from meat stock assorted vegetables. Over a bed of noodles of medium thickness float wood ear fungus, carrots, and bits of pork. It is a simple and very satisfying dish. 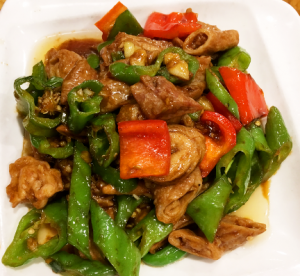 The pig intestines with green pepper were delightful. 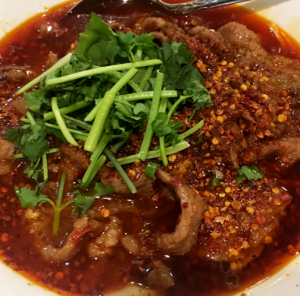 Pig intestines are soft and chewy, and here they were covered in a savory sauce. The green peppers were bitingly hot, and this dish became difficult to eat without something to wash it down with. Flushing’s Chinatown lacks the self-consciousness of Manhattan’s Chinatown; here there are not many shops selling Oriental fans and other trinkets to tourists, nor street vendors selling lucky bamboo in all fantastical forms. Instead, Main Street is packed with Chinese grocers and pharmacists, shops selling all kinds of house plants, and—of course—restaurants, many restaurants. 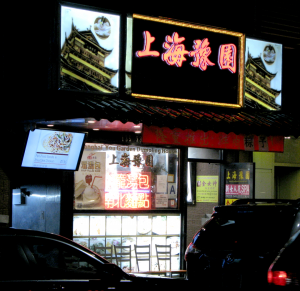 Flushing’s Chinatown also has a somewhat different culinary repertoire than Manhattan’s Chinatown. 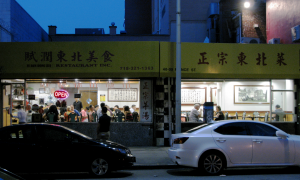 My impression is that the great majority of Chinese restaurants in Manhattan’s Chinatown serve Cantonese-style food. 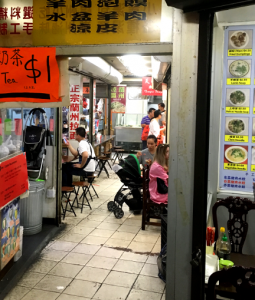 This may partly be due to the influx of immigrants from Hong Kong and elsewhere in South China that largely populated Manhattan’s Chinatown, and it may also partly be due to the popularity of Cantonese-style food with Americans. 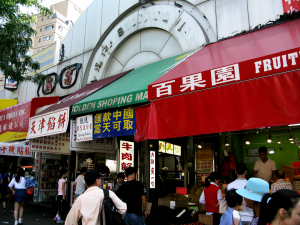 But Flushing’s Chinatown, which was once known as “Little Taipei”, has a greater mix of culinary styles. 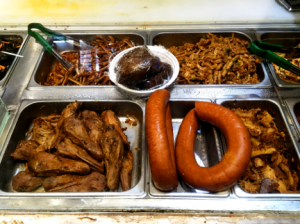 Faced with all of these culinary styles, I started my tour of Flushing’s Chinese food with what may be the simplest and arguably the oldest cuisine in China—Lu cuisine, or Shandong cuisine. This is the cuisine of the part of Northern China where Confucius lived. There is, in fact, a subset of Lu cuisine known as Kongfu cuisine, or Confucian cuisine, developed by Confucius’s descendants, many of whom, like Confucius before them, served in courts, apparently often as chefs. Perhaps not surprisingly given Confucius’s teachings, Kongfu cooking emphasizes “thoughtful preparation” (as Yan-Kit So put it) and presentation. 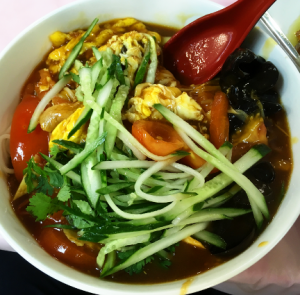 More generally, Shandong cuisine seems to be defined by a preference for certain cooking techniques and a greater frequency of certain ingredients—especially noodles, rice historically not having been easy to come by in north China. One of the techniques favored in Shandong cooking is braising, and my objective tonight was braised beef tendon. To find it, I went to a relatively unsung restaurant on Main Street called “Li’s Garden”. The interior of Li’s Garden is festooned with red Chinese Pan Chang knots and other folk decorations. There are two large banquet tables topped with Lazy Suzans, and possibly a dozen smaller tables. The atmosphere was festive when I went. A large party at one of the banquet tables laughed loudly and probably drunkenly—there was a pitcher of beer at almost every table in the room, except a table at the back, where they were drinking what looked like hard liquor. No one at Li’s Garden speaks English. The hostess knows a few phrases, which became helpful when I needed to take my leftovers home—but my waitress knew only a sprinkling of nouns. Luckily, the menu has descriptions of the food in English, so you can simply point at what you want. Nevertheless, if you don’t speak Chinese, there can be some confusion. When I placed my order, I asked in my broken baby Chinese if I was ordering too much for one person (I wanted to sample two dishes). My waitress gave a reassuring nod of comprehension and said, “OK, OK!” indicating with her hands not to worry. But when the food was placed in front of me, I wondered what she had thought I was asking. Braised beef tendon in brown sauce is a little like a stir fry, but the braising imbues all the mixed ingredients with a slightly slippery, oily quality. The tendon itself is soft but slightly chewy, flavorful but not as flavorful as fat. 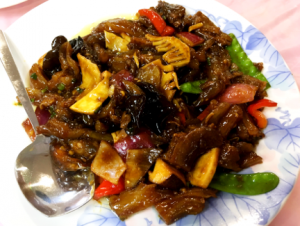 The dish also features wood ear fungus, bamboo shoots, peppers, onions, and peas. I am not sure what the brown sauce is. The flavor suggests it may be soy based, but it isn’t nearly as strong as soy sauce. There is no noticeable spice in the dish. The intent seems to be to showcase the natural flavors of the ingredients. It is tasty, but subtle, and it may strike some people as bland. I also ordered “a little bit of everything” noodles. This was another very mild dish, and here the desire to showcase the ingredients’ natural flavors was clearer. The broth was slightly sweet and sour, and the noodles and wood ear fungus took this flavor. 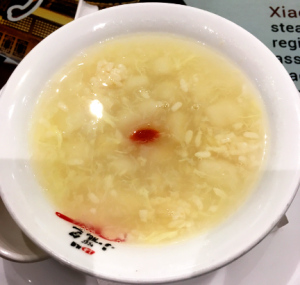 But the bits of egg floating in the soup had a surprising sulfurous flavor, tasting more strongly of egg than a hard-boiled egg. 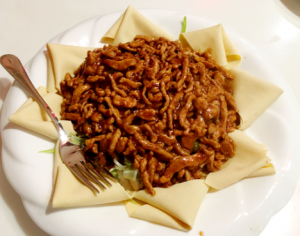 There are probably close to two hundred items on the menu at Li’s Garden, and I only chose these items because I wanted to try dishes representative of Shandong cuisine. 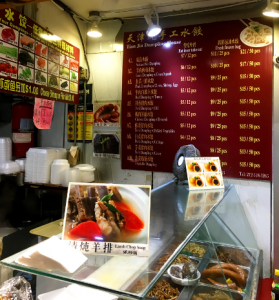 But for more adventurous diners, Li’s Garden has Frog in chili oil, Spicy duck in beer, Braised sea cucumber with scallion, Fish head with pancake, Pig ear with scallion, Jelly fish with mature vinegar, and so on. The desserts look very tempting—honey glazed sweet potato, honey glazed Japanese yam, honey glazed taro, sweet corn pancake, and deep fried butter buns. The eastern gate to Queensistan lies at the intersection of Queens Boulevard and 63rd Drive. Cheburechnaya is a short walk south from here, and Bukharian Broadway is a short walk northwest. Women stroll along 63rd Drive in old-world dresses chatting in Russian, and some stores post their signs entirely in Cyrillic. Just north of this intersection, you will find a rare jewel. Marani (which means ‘wine cellar’ in Georgian) is a Kosher Georgian restaurant, serving Georgian cheeses, spreads, kebabs, and dumplings (they have nearly everything Georgian you might want except Georgian wine; apparently no Georgian vintners have been certified Kosher). 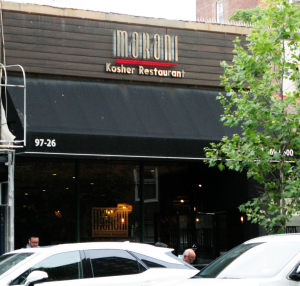 The nine days of Av just came to an end, meaning that observant Orthodox Jews are now enjoying being able to eat meat and drink wine again—and that Marani is open again after being closed for more than a week. Tonight the restaurant was, as a result, quite busy—filled with people of all ages, most of the men in yarmulkes. It is possible that some of the clientele of Marani are from Russia or Central Asia; I have heard that Stalin popularized Georgian food throughout the Soviet Union. 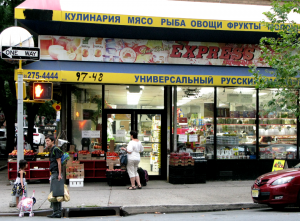 But I have also heard that there is a significant Georgian population in Rego Park, so it is likely that the clientele is mainly Georgian. The owner, in any case, is from Georgia, and I think the menu is a good representation of authentic Georgian food. I started with a sampler of Georgian spreads and a loaf of fresh-baked bread shaped like a leg of lamb. 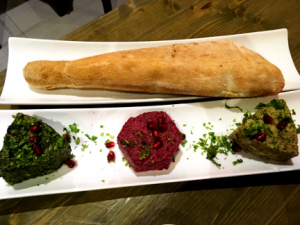 I was given three spreads on a platter: spinach and walnut, beet and walnut, and eggplant and walnut. The waitress explained that walnut was used to achieve a creamy taste and texture without using dairy (dairy foods are confined to a special bakery downstairs—which I will have to visit another time). Walnuts seem to be used heavily in Georgian food, however, so in this instance walnuts may have been a solution looking for a problem. In any case, the addition of crushed walnuts to these spreads renders them exquisite. The walnut is subtle, enhancing the other flavors rather than competing. With the help of the walnut, the spinach and eggplant become buttery. The beet becomes a medley of candied fruits. All three spreads have surprisingly bright and complicated flavors. My main course was khinkali, meat-filled dumplings. 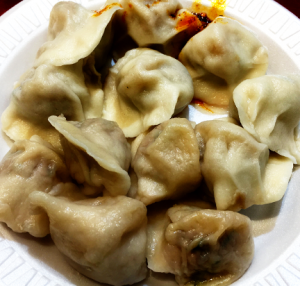 These are almost identical to Tibetan momos. They have the same thick, chewy shell. They are filled with the same mixture of meat and soup. The only obvious difference is that khinkali are much larger than momos, and in fact, one must drink the soup from them before eating them. (My waitress gave me a short tutorial: ‘You turn it upside down; then you take a bite, and drink the soup out of it’.) I think the flavoring of the meat may be a little different as well; khinkali seem to contain dill and other herbs, but momos usually have more onion, garlic, and chilies. (Since traders from Central Asia would have passed through Georgia, this may strengthen the argument that momos are Central Asian.) 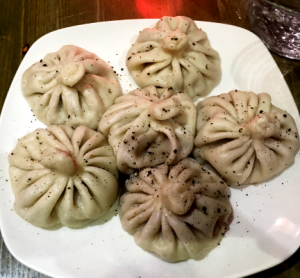 The herbs used in the khinkali reminded me of the herbs used in chebureki; Caucasian and Central Asian cuisine seem to share some things in common, besides Queens addresses.